Oppdag de gamle legender og Middelhavets skjønnhet Korint på en privat, full dagstur fra Athen eller Nafplio. Kryss Korintkanalen for å komme inn i Peloponnes, og kjør gjennom et område som er rik på vingårder og olivenlunder for å nå den mytiske underjordiske hulen. Kjør den historiske Odontotos Rack Railway, besøk ditt valg av enten Ancient Corinth eller Mega Playio Monastery, og nyt en tradisjonell gresk 'meze' lunsj i en fjellby, alt med omsorg for en dedikert guide og i komfort av et privat kjøretøy . If youre looking for something different, getting away from the main tourist attractions and experiencing some authentic Greek elements, then this is the trip to take. Our driver and host for the day, Nikos, arrived promptly at the agreed time, car clean inside and out with bottles of water and homemade cookies. He quickly introduced himself and outlined the day for us. He was very friendly and knowledgeable, able to answer all our questions. The first stop at the road side was to view the manmade canal and then onto Ancient Corinth where we toured around the museum and ruins. Our next primary stop would be for lunch, however, being a private tour we diverted off the route to view a small architectural church which was really splendid and then as we drove through a small village he suggested we go back and sample the coffee. After a brief discussion with the owners he was satisfied that the coffee would be good and we sat down to a great cup of coffee. A couple of off the cuff experiences also gave us the opportunity to see the roasting of meat over an open fire on the roadside. Unfortunately, we could not stay for lunch as we needed to move on to our next stop. After a brief walk around the town, up in ski country, we sat down for lunch. Nikos chatted with the waiter and then with our consent ordered food and wine. The food was authentic and really good, giving us some new flavours to try. It also provided us with the time to chat with Nikos at length as he ate lunch with us. It was then on to the rack railway train to go down the mountain, a 55-minute ride through some wonderful scenery. At the bottom, there was Nikos ready to then drive us back to our apartment after a wonderful private day tour. Forget the typical tourist spots that are heavily advertised - this tour by Nikos is the premier activity you can find in Greece and beyond. It combines history, food and nature combined with a pleasant and knowledgeable guide to make the best experience you could ever imagine. Under Nikos' guidance we were amazed at the Corinth canal with a stop to walk across it and observe the construction and design of this unique canal. Just after we were treated to a wonderful tour of ancient Corinth. This city is complex and sophisticated and defies your typical expectation of ancient ruins. You can clearly see the details of the city infrastructure and easily see how people lived and functioned there. It was also quite amazing to see and stand where the Apostle Paul did as he spoke with and interacted with the Corinthians. Later as we headed to the Cave of Lakes, Nikos introduced us to a leisurely stop in an small village square to try fine Greek coffee and just to enjoy some relaxation in the cool breezes and local color of the square. At the Cave of Lakes it was absolutely beautiful to see the formations and structure of this ancient cave. The cave was easy to navigate as a very substantial walkway made it comfortable and easy to tour and discover many beautiful sights. 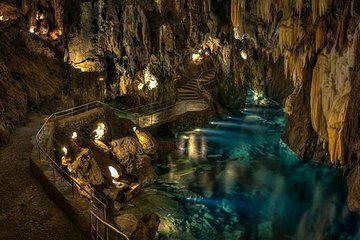 We have visited caves all around the world and this one is certainly one not to miss as it can hold it's own with any of the others we have seen. Next we had a terrific lunch at a small family run place picked out years ago by Nikos. He had subtly picked our brains on the drive to determine what foods he thought we would enjoy. So we left it to him to decide what to order. What a great decision on our part. Everything was wonderful and so fresh tasting with amazing combinations of flavors and variety. We were very pleased to learn that the outstanding food and drinks we had were all produced by the family and that easily explains why it tasted so wonderful. Next was the ride from the top of the mountain all the way down to the coast on a fantastic narrow gauge Odontotos railway. This was a 50 minute ride with outstanding views around every corner. Nikos arranged for us to be seated at the front so we had the best views. Our mouths were agape the whole way as we proceeded in what amounted to a ride inside the mountains seeing nature and views no one sees unless they take this train. If you think you have been on a scenic railway before, take this one and you will see the epitome of scenic. This was our last day of a 12 day trip and it was by far the most memorable experience. Thank you Nikos! Nikos picked us up at our hotel in Athens at 8am. I wasn't sure what to expect as there really was only one review of this tour. He drove us up to Corinth which was about an hour or so away. On the way we stopped at a man made canal which was extremely deep. I had never heard of a man made canal other than the Panama Canal so it was very interesting when Nikos told us the story. Once we got up to historical Corinth, we toured the ruins and the mini museum which were amazing. The landscape and history, we marveled at because it was so old. It was also awesome because Corinth is so far off the tourist path that it is a hidden gem. We were the only ones there at the time and could really take our time. Then we headed up to the Cave of Lakes and OMG I have never seen something so beautiful and awe inspiring. It was very cool in the cave which was a relief as we were touring in the hottest part of July. We got to walk in 500 meters and see 8 natural lakes which were so crystal clear and blue from the lighting. This cave was so awesome, it should be one of the wonders of the world. Again, it was a hidden gem and just opened to the public in 2006 and because it was off the beaten tourist path we saw it only with a guide and another couple from Greece. Nikos then took us to a small home town where we had a delicious authentic Greek lunch with wine. It was so very good, I tried making some of the dishes myself but couldn't come close to matching it. He then saw us off in the best seats on a small train taking us from the top of the mountain on a scenic ride down the mountain where he met us with Greek coffee that my aunt fell in love with at the coffee shop we stopped at on the way up. Nikos was the best tour guide. He was honest and personal and I know that we have now a very good friend in Greece. Our next trip there will most definitely include Nikos. If you are looking to really experience another culture, join Nikos! This private tour was one of our absolute favorite among our two week European vacation. Ancient Corinth was incredible to walk through to get a life-size idea of how the ancient Greeks lived, and the Cave of Lakes was breathtaking. Nikos immersed us into the culture, people and food of Greece, which was all amazing. What an experience! Highly recommend this private tour. this tour was superb . Our guide , Nikos , was amazing and a great guy . It was a pleasure to spend the day with him . The sites we visited were breathtaking . The food was authentic and very delicious . My children have not stopped talking about it . a truly memorable and worthwhile experience . We highly recommend . Cave of Lakes was mind-blowing and fascinating. Way beyond what you're expecting. We entered a mysterious winding world full of massive caverns, rock formations, and deep dark pools. Also the metal walkway was recent and well-designed. It was beautiful without being scary. The railway trip felt like a secret gem. It's a kind of hidden grand canyon in the Pelopennese. Wildflowers, rivers, towering cliffs, craggy tunnels, waterfalls. Very cool for the kids. Finally, the town of Kalavitra was truly enchanting. The best food of our trip. It's a kind of mountain ski town with snowy peaks and shops full of locally made cheeses.